With the thermometer registering 12 deg. 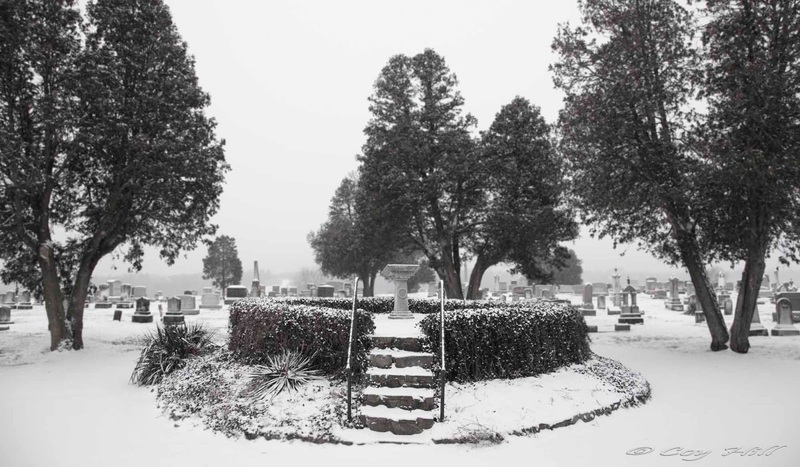 F and a fine snow softly falling, I walked through Union Cemetery today looking for an image that would resonate with my feelings of melancholy. Passing by tomb stones I noted some of people who had lived long lives and others who died before their life outside the womb had even begun. Thinking of these folks who have now gone on I could not help but think of their hopes and dreams, their emotions of love and hate, their financial success or lack there of and how it makes no difference now as their remains rests with the remains of their loved ones, family members, and also with those who they may have spent many years feuding with. As I walked the cemetery I could not hear the children playing, nor the sounds of their crying. I could not hear the happy chatter of the adults greeting their neighbors nor the angry words shouted during times of disagreement; only silence. Poignantly beautiful, Coy. Even memories of the deceased held by still living folk who knew them are but fleeting. Your post is a reminder that we should savour our sweet but temporary time above ground. Well said sir -- to quote from Breaker Morant "Live every day as if it was your last for someday you will be right." Beautifully written. It fits the melancholy of the photo. Long time since I stopped by. I'm glad to see you are still posting your great photography.